This post serves a couple purposes. Firstly, it is to apologise for how late I have been in providing a blog post to anyone who has been waiting for one. Secondly, I felt like using this post as a means for explaining its very own tardiness (hint: it was to do with the title). Grad school is hard. I can’t actually recall anyone telling me that grad school would be easy. Studying the humanities, at least philosophy (since that’s all I know right now), is hard. I equally don’t recall anyone telling me that philosophy would be easy. I think embedded in two of the sentences above calls to attention a deeper belief that exists as common (but not necessarily conscious) thought throughout engineering and the sciences. I noticed an unfortunate reality when in undergrad, which was a general idea that the degrees doled out by the College of Engineering carried more weight than those given out by the College of Literature, Science, and the Arts (LS&A). I must add though that those who held these beliefs were, in my mind, rather innocently holding these beliefs. I don’t think they could be held responsible for thinking that their major was harder, and more credible, than another’s. Engineering is hard work, too. Engineering could always be used as an excuse if I hadn’t entirely finished the reading for an english class, or for not being truly well-read enough in the theory of a topic being discussed a certain day in anthropology. I still managed to do what was necessary for most of my classes, and luckily my teachers managed to notice that I had a strong passion for (in my case) creative writing, anthropology, and music. However, now that I’m able to devote 100% of my time to studying philosophy, the topic is no longer a superfluous, cool term that I used in describing an idealistic, romantic view of a discipline. I can’t now just read about virtue ethics, or moral relativism, and think, “Yeah, that’s cool, maybe I can throw that into my arsenal of interesting topics to discuss with people… hopefully they won’t inquire further into the topic.” This use of vocabulary quickly changed when I came to UCL. (I recall getting looked in the eye directly, being asked to delve into what I meant about something I had just mentioned, and getting extremely nervous with this task. This is becoming easier each time the situation happens, thankfully.) I find myself, instead of expressing solidly a thought or belief that I had always held, stopping myself in my tracks and thinking of all the possible counter-arguments and descriptions of my thoughts. I’ve literally stopped talking mid-sentence to a friend when speaking about some political issue in the States because I started to really think about what I was saying. I blame this (happily) on philosophy. What makes an inequality an inequity? What is the nature of an inequity? Is it the fact that it is unfair? 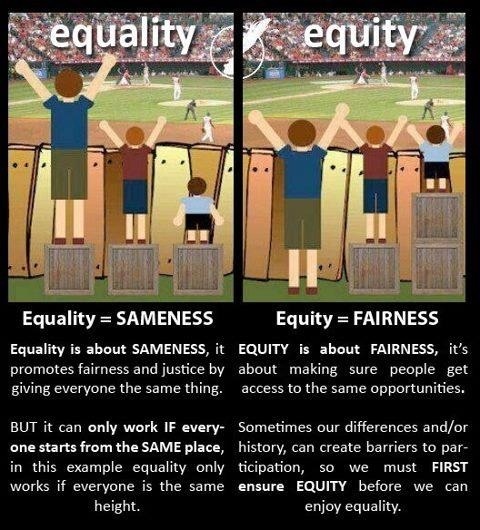 If an inequity is simply an unfair inequality, then what makes the inequality unfair? What’s telling you that anything is unfair? What school of thought are you using — perhaps some form of egalitarianism? Is unfairness dependent on who is responsible for the unfairness? What if someone purposefully puts himself into a position of inequality? Is this unfair if their decision was completely free and autonomous? What implies autonomy? Is it better to have more choice in life all the time? Is freedom directly related to the amount of choice one has? As you can see, the questions can spiral into other areas that might not work directly back to our initial question, but this is the nature of philosophy (at least in my mind). I’m quickly learning that I need to truly develop a difficultly intangible frame of reference on which I can build my argument. Since truly so many ideas have validity in philosophy, some may say that there is no right answer. However, I think this is really the beauty of philosophy. If there’s no right answer, then I had best be sure that I build my argument so well that, when I try to attack my argument as best I can with counter-arguments, the argument holds through and becomes believable by the reader. I remember listening to a lecture by Dr. Christian Casper in my senior design course, about the failed launch attempt of the Challenger space shuttle (apologies if I get any information wrong in this account!). The day of the launch was predicted to be colder than usual, and those in charge of the launch asked those who manufactured the shuttle to determine whether they believed it was safe for the rocket to be launched that day. Embedded in all of the data gathered from tests on this rocket was the fact that an integral part of the design (an o-ring, I think) had a really great chance of failing if the outside temperature was below a certain point. Essentially, it was going to be too cold to launch the rocket that day, but those in charge of the launch failed to be convinced by the engineer who worked with the o-rings and the shuttle. Alternatively, and perhaps more importantly, the engineer failed to present his data well enough so those in charge of the launch would be successfully convinced to not launch the rocket. The shuttle proceeded to explode and kill the entire crew aboard. Here’s where (at least one) utility in philosophy comes into play. Independent of whether or not there is one true, right answer (Truth with capital T), the way in which you present your argument has a large part to do with how those listening or reading will receive this argument. Humans do not function on facts. We can think of facts as blatantly true or false, or perhaps as 0’s or 1’s, the familiar binary code that computers use to process information. Humans, rather, are perceptive beings, despite how much truth our claims might hold, so we must present our ideas of the truth in such a way that will give them the best chance of being fully understood (where understanding is not the same thing as agreeing). After I finish this post, I’ll move into an evening of becoming evermore well-read, searching for the best counter-arguments for my own views, such that I can reinforce (or respectively and consciously change) my thoughts on what I believe to be important and worthwhile. Hopefully this process will end in a way that prepares me well for fighting for the health and well-being of various populations and people with whom we inhabit this earth. Have a happy rest of your weekend, friends! In some news, I’ll be taking part in a couple jazz shows happening on campus soon – one is called Fiesta, and is a night full of Latin, fun-filled jazz and dancing. The other is called “Cross-Currents”, a jazz fusion show that’s going to be played with minimal instrumentation and for an audience in an intimate (meaning small) setting. I’m really looking forward to these shows. On fearing death – why does it matter? “I’m afraid for when you die,” I’d timidly say. I can’t remember what my dad would say in response to this, but whatever he said was enough to get me to calmly go to sleep. I guess nighttime was the time I saw best for confronting the nature of my parents’ mortality. Is this normal for the common seven-year-old? Keep in mind, I wasn’t forced to do this – both of my parents were healthy, along with my sisters, and most of my extended family as well. We didn’t really have many health issues in our family outside of those seen as “due to old age.” This is surely not the case for many, many children in this world – too many children are forced to confront the nature of their parents’ mortality all too soon in life. I brought this story up in class last week, because the topic of class was simply, “Death.” This module, titled “Illness,” is where we try to take the idea of illness and examine illness’ place in society as a philosopher would. The first of a few readings we were assigned for this class was Epicurus’ letter to Menoeceus where Epicurus speaks, among other things, on the idea of fearing death, and what it means to think of death as being good or evil. Here we see that, considering two possible states (being dead or alive), we can’t really fear death as death itself, simply because we might cease to exist when we die, hence we cannot be present to do the fearing death. This isn’t necessarily contradictory to many religious beliefs, I think – in the Catholic tradition, life is found in death, hence I don’t really think Catholics (I can’t really speak much to other religions) believe in true death, but only physical death; Catholics believe in the eternal life of the soul. Going further, the only conclusive thing I can say about death are these words: “I don’t know.” I don’t know what lies on the other side of the passing of my body, I don’t know where my mind or soul goes. If we take Epicurus’ words to be true, we might be able to say that it’s not rational to fear death. However, I was speaking with a classmate after this week’s session and she drew the distinction between the idea of fearing death as being reasonable versus rational. The distinction I’d like to make here is that while it might not be rational to fear death, it might wholly be reasonable. This idea hinges upon the mere fact that we are social beings, and live in relation to others. Since I really, honestly don’t know when my death will come, and I won’t actually be able to know that I am existing “in death” (again please don’t construe this with ideas noted in whatever religion you might hold), then I really shouldn’t worry about life for my own sake. What I should worry about, though, is my life in relation to others, and others’ lives in relation to mine. I think it’s perfectly reasonable to fear the death of those I love, because if they leave this earth, or this realm, there would be nothing in this world that could fill the gaping hole in my heart and soul that their exiting would create. I have yet the capacity to experience their absence, and that absence would undoubtedly cause me to suffer as a result. I chose my words carefully in that last sentence, because the term “suffering” is an interesting one. Oftentimes, especially in biomedicine, suffering comes in tandem with pain (patient X is experiencing pain and suffering due to Z). However, after exploring the idea of suffering in class, it can’t really be said that all pain leads to suffering, nor that all suffering comes from pain. Suffering, in a broader sense, can be caused by all sorts of things in life, or simply by life itself. The loss of a loved one, a hard breakup, not getting that dream job… What I think I want to believe is that death is not the greatest evil in this world, rather it is the suffering that comes with death, or more generally, that suffering is something that we can rationally fear as humans. Suffering consists not only of the item that caused its existence (pain, death, etc.) but also of a unique temporal element. That is, suffering exists only in a narrative of life – of past, present, and future. If we think ourselves as suffering, then we usually know when the suffering started, and hope for when the suffering will end. Some might say that suffering is a good thing, as it builds character – however I would only agree with this if we can reasonably see that our future holds a time when the suffering we experience now will not exist. Without hypothesising any more on suffering, I want to turn towards biomedicine and the motives that drive biomedicine into such a high role in today’s society. It seems as though the role of biomedicine today is ultimately to stave off impending death, to relieve us of our mortal duties as humans, to keep us living as long as possible. I often turn to the concept of a quality adjusted life year, or the QALY. Yes, this time is adjusted for “quality” and not merely years lived – living off of a ventilator for 20 years, incapable of speaking or moving around, might in fact be worse than one year of being medically unhindered. However, the QALY is still attached to time – the QALY, and therefore our objectified goal in medicine, is temporally dependent. Why this dependence? I could imagine that one might want to extend her life because this gives her the opportunity to make longer, more meaningful connections to others, to leave a lasting impact on this world, and to effect change in the best way possible. We live for the future, we prepare ourselves for what might happen later on in life, and what we might be able to do with one more degree, with a little more work experience, or with a little more time spent in connection with others. I can’t argue against having more time spent with loved ones, but bear with me here and take that idea to the extreme. What if we had eternity to spend with others? If I had eternity to spend with my family, I might just pass up an opportunity to hang out with them for, say, another opportunity to go out and meet new people. However, strictly because I do not have eternity to enjoy my loved ones’ company, I might want to spend a little more time cherishing what time I do have with them. In this sense, our mortality, and its temporally limited nature, allows us to really cherish the relationships we have because we never really know when they’re going to end. Furthermore, if we spend all of our time fearing the end of our relationships, we would never have the time to really enjoy them in the present moment. I’m going to leave the conversation there for now. I do want to talk more about the goals of biomedicine and the role that suffering and death play, but this would require many more words, and a lot more thought and time. I’ll also use that time to ponder more on suffering, and how to actually tackle this idea philosophically. In other words, I’m going to devote an entire blog post to the matter instead of tacking it onto this post.